The combination of <prefwindow> and <prefpane>‘s provides Firefox addon developers with an effective mechanism for creating a preferences dialog. The best example of <prefwindow> usage is the Firefox options dialog. This tech note will focus on getting all the elements of the <prefwindow> framework right as it is fairly easy to miss one small element, leaving you scratching your head. Below is a screenshot of the end result. The code below a minimal <prefwindow> page with two <prefpane>‘s. If only one <prefpane> is used, the navigation bar is not displayed. When two or more <prefpane>‘s are used, a navigation bar is added at the top of the page. For this example, the contents of each <prefpane> are contained in external files, but you can place content directly between <prefpane> start and end tags. No content should appear above between the opening <prefwindow> element and the <prefpane> elements. If any scripts or other content must be defined, place them after the last <prefpane>. The root tag must be an <overlay>. Here is an example for the <prefpane> with id="paneProfiles". This markup is repeated for each <prefpane> you need to define. Only the id attribute must be unique. Quick update on Firefox 3.6. Modify Headers and XHTMLMP have both been successfully tested in beta 4. The max version for each has been bumped at AMO and both are now available for install into 3.6. Initial Mailfrom testing has revealed a couple of defects. I’m going to work on those over the next week and hopefully have it done before GA release or Christmas (whichever comes first). I’m going to be running the Winter Pineapple Classic, a 5K (3 mile) ‘fun’ run over obstacles on Saturday November 14. The event is to support the Leukemia & Lymphoma Society. Any and all donations are gratefully accepted and can be made up until December 4, 2009 at this special page. Back in April I released Modify Headers 0.6.6. This version fixes a bug in the import function introduced in 0.6.5. This last weekend, I tested Modify Headers, XHTML Mobile Profile and Mailfrom on Firefox 3.5b4 successfully. All the addons are now updated to work with the beta. Modify Headers 0.6.5 was released over the weekend. This adds a new column on the list of headers to provide a comment for each entry. 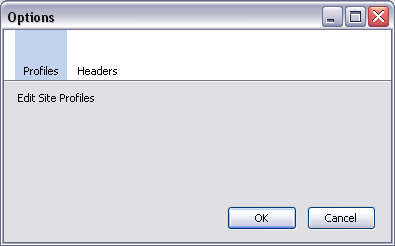 In addition an enhancement to float the admin window to the top if a user clicks on the Tools menu item was implemented. The new release should update automatically for most users, or it can be downloaded At Mozilla Addons. At long last I’ve been able to get the blog back up and running after almost a month of down time. At the end of June my webhost had a double disk failure on the server that hosts the virtual server and all the data was lost! Thankfully I had setup a daily cron job to email a backup of all the databases. It’s taken a few weeks to get everything back up and running. First I had to get some websites I host restored, second work has been incredibly busy (50 – 80 hrs a week) and on top of that I’ve been working on a new website for a charity here in Seattle. At long last I’ve had the time to get the blog back. This should serve as a warning to anyone who has a virtual server: KEEP REGULAR BACKUPS. Both Modify Headers and XHTML Mobile Profile have been updated this week. Version 0.6.4 of Modify Headers fixes a nsIObserver interface problem with the add-on working in Firefox 3 beta. XHTML Mobile Profile 0.5.3 adds support for the content type application/vnd.wap.multipart.mime. Mailfrom 0.2 was released over the weekend. This adds support for AOL Mail and handling for subject lines in mailto links. Shutdown cygserver (if running): net stop cygserver. After this, I restarted the cygserver service and apache and mod_rewrite worked perfectly.